They say imitation is the sincerest form of flattery. I’m wondering if “they” had a clothing line that was being counterfeited on Amazon. I’m guessing probably not. 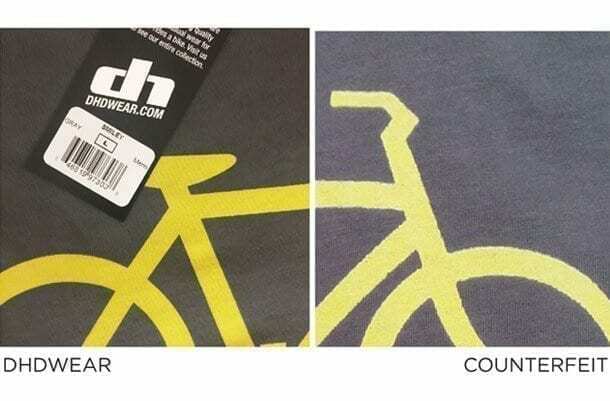 DHDwear is a small cycling themed clothing company based in Southern California. We design and print locally and ship every order from our facilities. We support retailers and cycling events across the USA. We sell all over the world from our DHDwear.com web site and from our “authorized” resellers Amazon accounts. We’re guys who like to ride bikes and enjoy making t-shirts for cyclists. It’s taken us the better part of four years to streamline our process from design to production and we’ve learned a lot (good and bad) along the way. Most recently, we’ve learned there are dozens of counterfeit Amazon sellers, falsly representing themselves as “authentic”, stealing our designs and reproducing them with lowest quality on the cheapest t-shirts on the planet. We’ve also learned that they use our own photos to sell their “product” and nobody is the wiser until the customers get their fake DHDwear shirt and wonder what the hell happened. We cringe going thru comments on Amazon where some buyers complain about the shirts thinking that they bought from DHDwear. After all, the Amazon listing featured a legitimate DHDwear shirt and listed it as a DHDwear shirt and shows that it ships from the USA. None of these comments instill confidence for the next potential buyer. You’d think that simply bringing the matter up to Amazon would solve the problem. Well, think again. Amazon requires us to actually purchase the counterfeit shirts, prove to Amazon that they are “fake” and then Amazon says they will look into the mater and potentially shut down the culprits seller account. Problem solved right? Nope. Almost immediately after Amazon shuts down the counterfeiter’s account, another store pops up selling the same product. Most of the shirts we have on Amazon have between 20-30 counterfeiter’s accounts selling their version of our shirt. Easy to spot? Nope. When the counterfeiter’s account uses our photos to sell their product, it’s impossible to know. We sell most of our shirts online for $23.95 and we cover the shipping. To the buyer who doesn’t know any better, it looks like they can get the same shirts for about ten bucks cheaper if they look around a little bit on Amazon. “Buyer Beware” has never been so appropriate. Forbes recently reported that nearly 90% of “Genuine” Apple phone chargers sold on Amazon are fake. CNBC reports that the issue of counterfeit products on Amazon is growing at an alarming rate. T-shirts aren’t the only things getting counterfeited on Amazon. From t-shirts to sporting goods and electronics and everything in between, it’s hard to know what is a legitimate product on Amazon. We’ve noticed a few dead giveaways on conspicuous items. 1). Products shipped from China or India. A lot of the counterfeits of our merchandise shows shipping from out of the country although many also show New York or another stateside address so this isn’t always the case. Sellers ship from overseas to stateside and then reship from there to get around this. 2). If the price is significantly less than the known retail price, be suspicious. Unless the item is being sold as used, if the price is 30% – 80% less, keep on investigating. 3). What’s the seller’s rating? Go into the seller’s profile and see what past buyers have to say about the particular seller. 4). What are the customer reviews of the product? Check out what customers have to say about the product. It’s hard enough to grow a small business today without the added complication of needing to spend a massive amount of time and funds fighting off counterfeiters. Amazon is supposedly cracking down on sellers who retail counterfeit products in a bid to safeguard major brands. Sellers who are looking to put up products from various big name brands will need to pay a one-time fee that ranges from $1,000 to $1,500 and is non-refundable. In its attempt to counter the selling of fake products, Amazon also ensures that along with the fee, the sellers provide the necessary paperwork that guarantees the genuineness of the branded products up for sale. Hopefully Amazon protects the integrity of their brand and addresses the problem soon to help the small business out or there won’t be any small businesses left on Amazon.